Welcome to the Invite All Friends to a Page App * Now 2 Friends can both share each other's Pages, and the likes on both pages will rocket! * HOW IT WORKS ------------------------- 1. Log into Facebook 2. 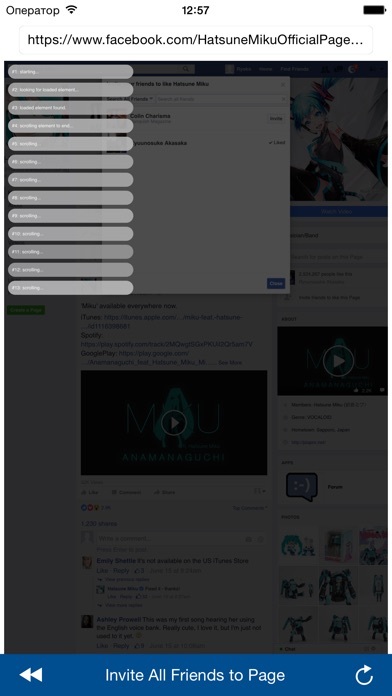 Simply browse to the "Page" and select "Invite All Friends to Page" at the top of the screen. 3. the script runs.... first finding all your friends and then inviting them 4. if you start to see security images popup, then it is a good time to stop for the day. 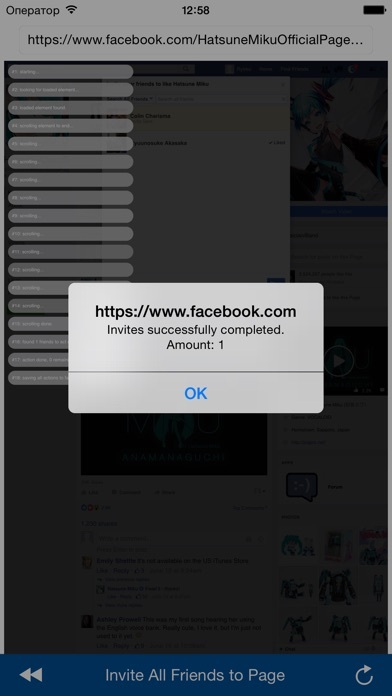 usually sending way too many page invites in a day can result in a temporary block of this function So the best way to actually use this app is to invite several hundred a day, over a few days. 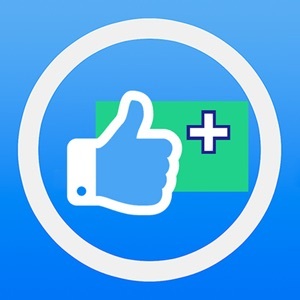 - This App DOES also work for Events - This App does NOT work for Groups TROUBLESHOOTING -------------------------------- 1. occasionally on your own pages (invite all to your own page) it may need to be run twice. (on some occasion if a page already has thousands of invites, facebook can prevent more invites) 2. Make sure you are on a facebook page. (this won't work on a normal website or FB Profile / Group) 3. the address bar is at the top so you can actually go directly to the page if you choose. if all else fails try navigating directly to the page and then trying the button. This script sometimes does not work if facebook has a restriction on your page. I LOVE THIS APP -------------------------- If you love this App as much as we do, Please share the love and invite friends to our pages: https://www.facebook.com/vanquishmagazine (Vanquish Magazine) http://www.facebook.com/glamourphotographs (Colin Charisma Photographer) Thank You :) NEW TO VERSION 1.02 --------------------------------- New major feature button to invite friends to an event. 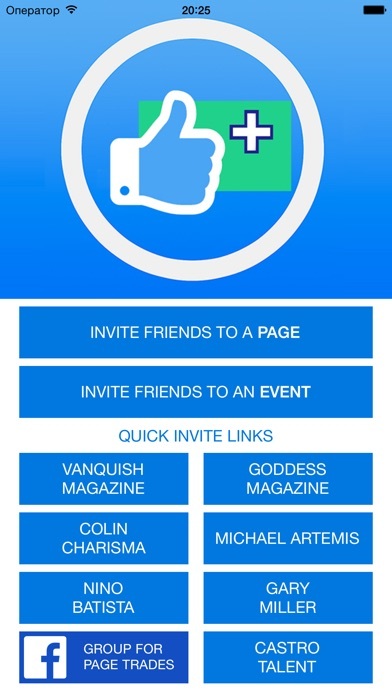 With millions of Fans reading Vanquish Magazine we wanted to make this app truly useful for our key photographers and models, and so we have included quick invite buttons This will make inviting friends to your favorite magazine, photographer or agency even easier. 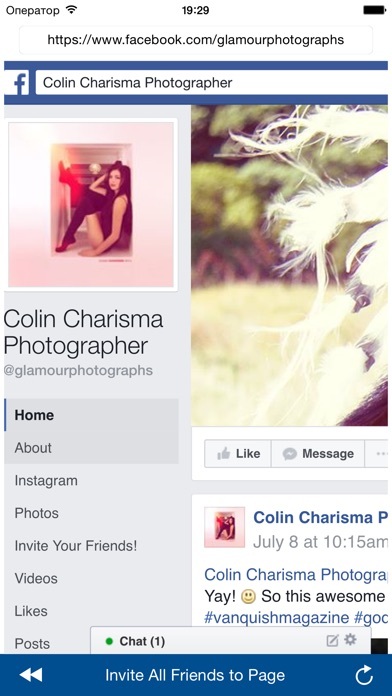 These key photographers literally work with hundreds of models, making it easy to share and invite friends to a page with the touch of a button We have designed a very simple menu with quick invite buttons. NEW TO VERSION 1.03 --------------------------------- Now it is even easier to trade with others. Many people have downloaded this app to exchange traffic with friends, but typically only use it once or twice with friends, and are then keen to trade with other people, but need a way to find them. Now there is a way. We have added a button for the "Invite Friends to a Facebook Page" Group to make it super easy to find other people to do page trades with. NEW TO VERSION 1.04 -------------------------------- Updated Icon and Branding NEW TO VERSION 1.15 -------------------------------- Fixed a recent error where invites would not work on pages sometimes. All working perfectly again now. NEW TO VERSION 1.2 -------------------------------- Fixed an error where the invites would not work, issuing a "This is not a page or event" error.